Women and girls should be able enjoy their basic right to feel safe in their everyday lives. Women are still being “failed” in many areas of life, the Equality and Human Rights Commission (EHRC) has warned in its largest ever review of women’s rights. In its new report, Pressing for progress: women’s rights and gender equality in 2018, which was presented to the United Nations in Geneva on 23 July 2018, the Commission has said the UK government needs to take more action to better protect women and girls from violence. The report sets out a number of concerns and recommendations including that there should be better support for survivors of domestic violence, a higher prosecution and conviction rates for violent crimes against women and girls, and a review of hate crime legislation. 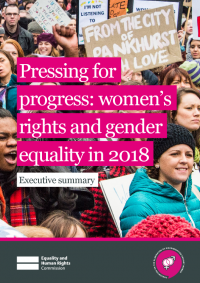 The report also emphasises the importance of ensuring that there is no regression in equality and human rights protections as a result of the changes introduced as the UK leaves the EU, and that we do not lag behind future developments in equality and human rights. It also highlights that funding for women’s services could well decrease as a result of Brexit. It assesses the progress on women’s rights since 2013 and makes in areas including: enhancing the status of international human rights in domestic law, gender-based violence, harassment and abuse, participation in political and civic life, access to civil justice, human trafficking and modern slavery, detention and asylum, health, living standards and social security, and work and education. Improving data collection and understanding of sexual harassment and sexual violence in schools, disseminate guidance, and improve teacher training on how to recognise and address such behaviour. The review has also highlighted the continued need to tackle discrimination in the workplace and ensure just and fair conditions of work. The recommendations regarding workplace issues include prohibiting employers from asking job applicants questions related to pregnancy and maternity, following our research into employers’ outdated employment practices; addressing problems with the availability and affordability of properly regulated childcare; and legislating to extend the right to request flexible working to apply from day one in all jobs. And following a worrying rise in self-harm in women’s prisons and ongoing concerns around the treatment of women in immigration detention, the regulator is also calling for the greater use of community sentences for women, better access to mental health services and a time limit on how long women can be held in immigration detention. Rebecca Hilsenrath, chief executive of the Equality and Human Rights Commission, said: “There is a lot to celebrate in terms of the awareness and realisation of women’s rights right now: it’s been 100 years since some women got the vote, forced marriage has been criminalised, and we’ve seen great strides in the workplace through shared parental leave and the successful introduction of gender pay gap regulations. “Yet it is estimated that only 15 per cent of survivors of sexual violence report their experience to the police, and social movements such as #MeToo continue to shine a spotlight on areas where women are being failed. “The priority must now be ensuring that women and girls of all ages can enjoy their basic right to feel safe in their everyday lives. The full report and list of recommendations has been submitted to the United Nations as part of its review into the UK’s women’s rights record which is in turn part of its work on monitoring the Convention on the Elimination of All Forms of Discrimination against Women (CEDAW), the international human rights treaty often described as the bill of rights for women that focuses specifically on equality between women and men in all areas of life. Please forward the link to your MP and ask them to raise the issues in Parliament.